Background: The gingival crevicular fluid (GCF) may be a valuable adjunct in the initial diagnosis and assessment of the severity of periodontal disease in patients with hypertension and diabetes. The GCF volume may be used to monitor and plan appropriate dental treatment and prevent progression of disease in adult patients with malocclusion who have hypertension or diabetes. Aim: The aim of this study is to determine the volume and correlation between blood pressure, blood sugar and GCF volume in adult females with malocclusion in Benin City, Nigeria. Methods: A total of 152 fasting women aged 26–65 years were divided into two groups as follows: Group 1: Malocclusion; n = 82 (54%) (crowding - 41, spacing – 39 and anterior open bite - 2) and Group 2: Normal occlusion; n = 70 (46%). Blood pressure and blood sugar values were obtained and the GCF volume measured. Correlations between age, gender, probing depth, malocclusion, blood pressure, blood sugar and GCF volume were determined using the Statistical Package for Social Sciences (version 16) software. Significant values of P < 0.05 were applied. Results: The highest GCF volume in the total sample studied was 2.17 μL in 1.3% and the most prevalent was seen in 0.62 μL in 42.8%. GCF volumes of 0.93 μL were most prevalent in crowding in 14.6% and in 0.62 μL in spacing in 9.9%. Furthermore, a GCF volume of 0.62 μL was highest in blood pressure of 121/89 mmHg in 9.9% and blood sugar levels of 80–120 mg/dl in 25% of subjects, respectively. Malocclusion (crowding, spacing and anterior open bite) exhibited a higher number 45.1% in GCF volume of 0.62 μL. There was, however, no significant relationship between blood pressure, blood sugar and GCF volume (P > 0.05) in both the malocclusion and control groups. There was also a statistically significant difference between GCF volume and pocket depth (P < 0.01). Conclusion: This study revealed that blood pressure and blood sugar levels in adult females with malocclusion do not affect GCF volume. A positive correlation, however, exists between GCF volume, pocket depth and oral hygiene in Benin City. Studies have demonstrated that plaque and gingivitis predispose to periodontal disease with a resultant increase in GCF volume. These include overgrowth of the gingiva as a result of poor oral hygiene due to poor patient care, or malposition of the teeth as in certain types of malocclusion.,, Other studies on malocclusion also found a greater incidence of gingivitis and periodontal disease in subjects with malocclusion., Lower arch crowding in the lower incisal region was identified as being a prevalent form of anterior segment crowding ,, and may be a predisposing factor to the initiation and progression of periodontal disease in that area.,,, Certain conditions also predispose to gingival overgrowth and subsequently periodontal disease and include overhanging margins in improperly restored teeth,, certain systemic diseases including diabetes,,,, hypertension and drug-induced gingival overgrowth.,,, There appear to be no studies in our environment correlating systemic disease, malocclusion and GCF volume. Various studies identified a positive correlation between the severity of inflammation of the periodontal tissues and an increased volume of GCF.,, Other factors can also influence the rate of production of GCF and include endotoxins  and phagocytosis following trauma. Many studies have been carried out on the correlation between the various conditions and factors that increase GCF volume,,,,,,,,,,,,,,, with apparently no studies on the volume and its correlation with either malocclusion or systemic disease in our environment. Studies by numerous authors ,,,,,,,,, measured the volume and rate of flow of GCF and various methods of collection ,,,, which include the use of absorbing paper strips or paper points, twisted threads placed around and into the sulcus, micropipettes, capillary tubes ,,, and intracrevicular washings. Methods of collection could also be extracrevicular, intracrevicular superficial  or intracrevicular deep., The amount of fluid collected on a strip may be evaluated by staining with ninhydrin to make it more visible and measured plainmetrically on an enlarged photograph or with a magnifying glass or microscope.,,, Alternatively, capillary tubes of known internal diameters can be used to obtain GCF and the volume of fluid obtained by capillary action estimated using the height of the fluid column and the volume from the internal diameter and the length of the tube., Studies have also shown that collections of large volumes of GCF are best collected with the capillary tube method.,,, Excessive volumes of GCF from diseased sites can also be obtained using absorbent paper strips. A review of the literature, however, did not reveal any study in our environment on methods of collection of GCF fluid in either normal or patients with systemic disease. The amount of GCF fluid collected however varies and studies have demonstrated different volumes from different sites ,, and in different clinical conditions. The sites identified for GCF collection include the labial aspects of crowded incisal teeth,, interradicular and the mesial and distal aspects of teeth (interproximal sites)., Volumes collected from these sites have ranged from 0.1 μl in slightly inflamed gingiva to 2.9 μl and above in clinical cases of periodontitis ,,,,,, which may be as a result of the systemic disease. This study aimed to evaluate whether blood pressure and blood sugar affects GCF volume in adult females with malocclusion in Benin City, Nigeria. No restoration or prosthesis on the selected tooth. Written and informed consent was obtained from women who agreed to have their blood sugar and blood pressure tested as well as their mouths examined, respectively. Ethical clearance was also obtained from the University of Benin Teaching Hospital Ethics Committee. All information and results were entered into a pre-structured pre-tested questionnaire. Malocclusion was divided into crowding, spacing and anterior open bite. Anterior open bite: Was determined if there was an actual vertical gap between the upper and lower incisors with the jaw in centric occlusion. 121 mg/dl and above - Diabetes. >4 mm - Periodontal pocket. The clinical examination was carried out between 7 am and 10 am on the same day by a team of calibrated examiners (two dental surgeons for the oral examination) and six trained nurses using the same brand of blood pressure equipment (Omron M2®) and glucometer (Finetest Autocoding™ Premium). No examination and test were carried out after 10 am and only women who were fasting were included in the study. A total number of 298 women were available but after the inclusion criteria were applied, a total sample size of 152 was obtained. Intra-oral examination was carried out using natural light and disposable mouth mirrors and probes to determine the oral hygiene status and pocket depth of each participant. Sterile cotton gauze was placed in the lingual sulcus to prevent saliva contamination. The intracrevicular deep method was used to collect the GCF sample. Size thirty sterile paper points were gently inserted into the gingival sulcus of the labial aspect of the middle of the lower central incisor for all participants until a slight resistance was felt and left in situ for 60 s. The amount of fluid visible on the paper point after withdrawal was measured (in millimetres) using a metal ruler and transferred onto the pre-structured questionnaire of each subject. The intra-examiner reproducibility was assessed using re-examination of twenty randomly selected women 1 h after their initial selection. The kappa score was 0.80 indicating a good agreement. The liquid would increase a maximum height of 27 mm. 1 μL = 1 mm  and a 10% change in diameter (1.1–1.2 mm) leads to a 21% change in volume giving a range of 71–85 μL. The fluid collected in the randomly selected patients using the capillary tube method (extracrevicular) rose between 0.1 and 1 mm (measured with self-locking vernier calipres) and this fluid was transferred to sterile dry size thirty paper points. The distance the fluid travelled on size thirty paper points (intracrevicular method) was measured and used to give a baseline for this study (1 mm of fluid collected in the capillary tube is 3.1 μL and this measured 10 mm on the paper points). A comparative analysis between these two measurements gave a Kappa value of 0.82 indicating good agreement. The data obtained was analysed using the Statistical Package for Social Sciences software version 10. Statistical tests of significance between frequencies and gender differences were evaluated using the Chi-square test. The confidence level was set at 95% and probability values (P < 0.05) were considered statistically significant. A total of 152 female participants aged 26–65-year-of age were included in the study. The 31–40-year-old age groups were the highest number in 47 (30.9%) and the 61–65-year-old age group the lowest number in 12 (7.9%). Other age groups included the 26–30-year-old in 20 (13.2%), the 41–50-year-old age group in 40 (26.3%) and the 51–60-year-old in 33 (21.7%). Half of the sample population, 76 (50%) had normal blood pressure, whereas 19 (12.5%) had blood pressure between 140–159 and 90–99 mmHg and 20 (13.2%) had between 160/100 mmHg and above. A GCF volume of 0.62 μl was highest in 32 (49.2%) for blood pressure ranges between 120/80 mmHg and below. [Table 1] shows the distribution between GCF volume and blood pressure ranges. Crowding 41 (27%), exhibited the largest number with normal blood pressure seen in 20 (26.3%). Spacing was seen in 39 (25.7%) of the entire sample studied with the largest number of 17 (22.4%) with normal blood pressure, and 2 (10%) seen with blood pressure ranges of 160/100 and above. Anterior open bite was seen in an equal distribution with normal blood pressure and 140–159/90–99 mmHg in 1 participant, respectively. There was no significant relationship between blood pressure and malocclusion. [Table 2] shows a distribution between oral hygiene and blood pressure ranges. Oral hygiene was assessed as good in 23 (15.1%), fair in 54 (35.5%) and poor in majority of 75 (49.3%). Majority of sample 100 (65.8%) had elevated fasting blood sugar levels of 80–120 mg/dl, 22 (14.5%) between 121 mg/dl and above and was more prevalent in the 41–50-year-old. Normal blood sugar levels were seen in 30 (19.7%). Blood sugar levels were highest in malocclusion (crowding spacing and AOB) in values of 80–120 mg/dl. [Table 3] shows a distribution of blood sugar levels and GCF volume. Malocclusion was seen in 82 (54%) with a breakdown of crowding in 41 (27%), spacing in 39 (25.7%) and anterior open bite in 2 (1.3%). A control group with normal occlusion of 70 (46%) was also included. 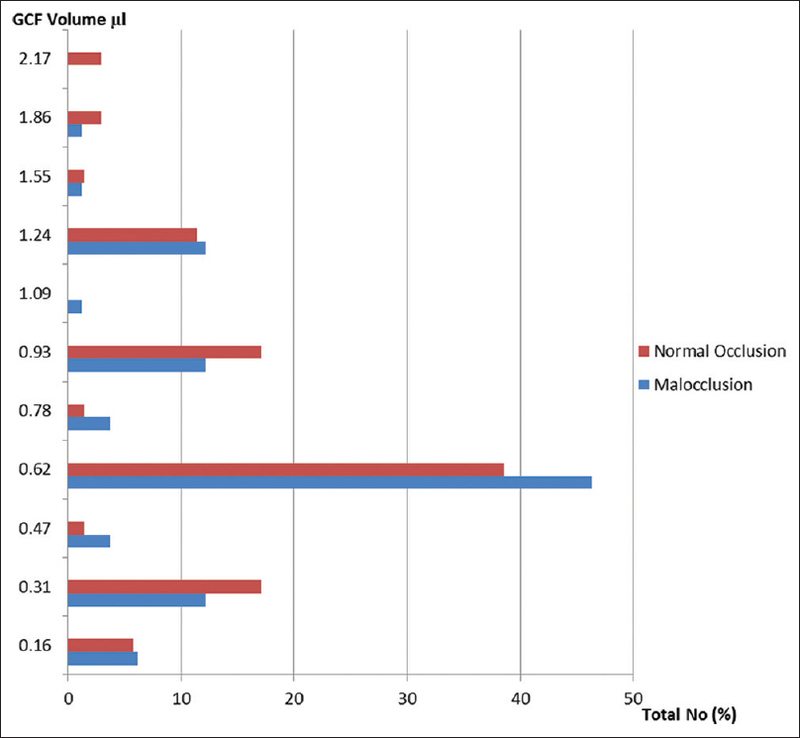 [Figure 1] shows a comparative analysis between GCF volume, malocclusion and normal occlusion. There was a significant correlation P < 0.01, between oral hygiene and GCF volume GCF volume ranged from 0.16 to 2.17 μl with pocket depths of 0.5–7 mm. There was also a significant but weak correlation; r = +0.18, P < 0.01, between pocket depth and GCF volume [Figure 2]. The present study investigated if blood pressure and blood sugar levels would affect the GCF volume in adult females with malocclusion in Benin City, Nigeria and compared it with a group of women with normal occlusion. Other studies demonstrated that periodontal health, GCF volume and flow rate are influenced by behavioural changes which include smoking, oral hygiene, diet, malocclusion and systemic disease.,,,,,,,,[34 Previous studies investigated the association between gender in systemic disease and periodontal health , while others associated GCF volume, flow rate and composition, in subjects with gingival inflammation and periodontal disease., Hormones have been found to play a role in certain physiological and pathological disease states.,, A study determined that there is a variation in the severity of gingivitis and periodontitis in pregnant females when compared with normal women as a result of variations in the hormonal level. Our study determined that systemic diseases including high blood pressure and elevated blood sugar levels does not affect the periodontal health of females with malocclusion in our environment. While the study did not show any association between high blood pressure and GCF volume, studies by Rivas-Tumanyan et al. did not also observe any association between high blood pressure and periodontal disease. This is in contrast with a study where patients with poor oral hygiene tended to have higher blood pressure levels than healthy subjects with good oral hygiene. However, a clinical relationship between high blood pressure and pocket formation as a result of severe gingivitis and aggressive periodontitis has been demonstrated to exist.,, Other studies , have identified a positive relationship between pocket formation and GCF volume which is in agreement with the present study where a pocket depth of 7 mm recorded the highest GCF volume of 2.17 μl. Studies by Tymkiw  also demonstrated the highest GCF volumes of 2.1 ± 0.8 μl in patients with periodontitis. The present study demonstrated a significant relationship between blood pressure and age but no correlation between blood pressure and pocket formation. This is in agreement with other studies  where an increased blood pressure level is associated with an increase in age. There was also no relationship between blood sugar, age, oral hygiene and GCF volume in this study. This is however in contrast with other studies ,,, where an increased blood sugar level has been shown to modify periodontal disease with an increased prevalence of gingivitis and periodontal disease. This study found a highly significant difference between GCF volume and oral hygiene with some of the participants (49.3%) demonstrating a poor oral hygiene. This is in contrast with studies on malocclusion by Onyeaso et al. who found majority of the subjects with a good oral hygiene. This is due to the fact that their study  was clinic based with patients educated on the need for good oral hygiene, whereas our study was carried out in a community with no prior exposure. The present study is also in agreement with numerous studies which found a correlation between oral hygiene and GCF volume.,,,,,,,,, This study found out that poor oral hygiene as a result of malocclusion had a significant relationship on GCF volume. Lower anterior arch crowding was identified as a predisposing factor in plaque retention which may result in gingivitis and periodontitis.,,, Majority of participants in this study had lower anterior arch crowding which is in agreement with other studies , and also an increased GCF volume. Studies by Gomes et al. showed a significant relationship between periodontal probing depth and GCF volume which is in agreement with the results of the present study. Other studies have identified increased probing depth in systemic diseases especially increased blood sugar levels.,, This is at variance with the present study where there was no association between elevated blood sugar levels and probing depth. However, there was a weak positive linear relationship between the GCF volume and pocket depth when compared with the total number of participants. This study revealed that there is a significant relationship between GCF volume, pocket depth, malocclusion and oral hygiene and no association between blood pressure and blood sugar levels. Newman MG, Takei HH, Klokkevold PR, Carranza FA. Carranza's Clinical Periodontology. 11th ed. St Loius Missouri: Elseiver Saunders;2012:263-6. Brill N, Krass B. The passage of tissue fluid into the clinically healthy gingival pocket. Acta Odontol Scand 1958;16:223-45. Goodson JM. Gingival crevice fluid flow. Periodontology 2000 2003;31:43-54. Brill N. The gingival pocket fluid studies of its occurrence, composition and effects. Acta Odontol Scand 1959;20(Suppl 32):32. Pashley DH. A mechanistic analysis of gingival fluid production. J Periodontal Res 1976;11:121-34. Golub LM, Kleinberg I. Gingival crevicular fluid: A new diagnostic aid in managing the periodontal patient. Oral Sci Rev 1976;8:49-61. Miller J, Hobson P. The relationship between malocclusion, oral cleanliness, gingival conditions and dental caries in school children. Br Dent J 1961;111:43-52. Bollen AM. Effects of malocclusions and orthodontics on periodontal health: Evidence from a systematic review. J Dent Educ 2008;72:912-8. Onyeaso CO, Arowojolu MO, Taiwo JO. Oral hygiene status and occlusal characteristics of orthodontic patients at University College Hospital, Ibadan, Nigeria. Odontostomatol Trop 2003;26:24-8. Abdulwahab B. Lower arch crowding in relation to periodontal disease. MDJ 2008;5:154-8. Richardson ME. Late lower arch crowding in relation to primary crowding. Angle Orthod 1982;52:300-12. Ize-Iyamu IN. Prevalence of retained primary teeth among children with anterior arch crowding in Benin City, Nigeria. Ann Biomed Sci 2011;10:21-8. Diedrich P1. Periodontal relevance of anterior crowding. J Orofac Orthop 2000;61:69-79. Al-Jubory HA. Gingival fluid status in improperly restored and non-restored teeth. J Coll Dent 2005;17:77-9. Fitzsimmons TR, Sanders AE, Bartold PM, Slade GD. Local and systemic biomarkers in gingival crevicular fluid increase odds of periodontitis. J Clin Periodontol 2010;37:30-6. Marchetti E, Monaco A, Procaccini L, Mummolo S, Tete S, Baldini A, et al. Periodontal disease: The influence of metabolic syndrome. Nutr Metab 2012;9:4-10. Cakic S. Gingival crevicular fluid in the diagnosis of periodontal and systemic diseases. Srp Arh Celok Lek 2009;137:298-303. Lamster IB, Ahlo JK. Analysis of gingival crevicular fluid as applied to the diagnosis of oral and systemic diseases. Ann N Y Acad Sci 2007;1098:216-29. Ellis JS, Seymour RA, Monkman SC, Idle JR. Gingival sequestration of nifedipine in nifedipine-induced gingival overgrowth. Lancet 1992;339:1382-3. Monkman SC, Ellis JS, Cholerton S, Thomason JM, Seymour RA, Idle JR. Automated gas chromatographic assay for amlodipine in plasma and gingival crevicular fluid. J Chromatogr B Biomed Appl 1996;678:360-4. Ellis JS, Seymour RA, Monkman S, Idle JR. Disposition of nifedipine in plasma and gingival crevicular fluid in relation to drug-induced gingival overgrowth. J Periodontal Res 1993;28:373-8. Ranney RR, Montgomery EH. Vascular leakage resulting from topical application of endotoxin to the gingiva of the beagle dog. Arch Oral Biol 1973;18:963-70. Loe H, Holm-Pedersen P. Absence and presence of fluid from normal and inflamed gingivae. Periodontics 1965;3:171-7. Söderholm G, Atiström R. Vascular permeability during initial gingivitis in dogs. J Periodontal Res 1977;12:395-401. Sueda T, Bang J, Cimasoni G. Collection of gingival fluid for quantitative analysis. J Dent Res 1969;48:159. Cimasoni G, Giannopoulou C. Can Crevicular Fluid Component Analysis Assist in Diagnosis and Monitoring Periodontal Breakdown? Periodontology Today, International Congress. Zurich, Basel: Karger, 1988; 260-70. Kaslick RS, Chasens AI, Mandel ID, Weinstein D, Waldman R, Pluhar T, et al. Quantitative analysis of sodium, potassium and calcium in gingival fluid from gingiva in varying degrees of inflammation. J Periodontol 1970;41:93-7. 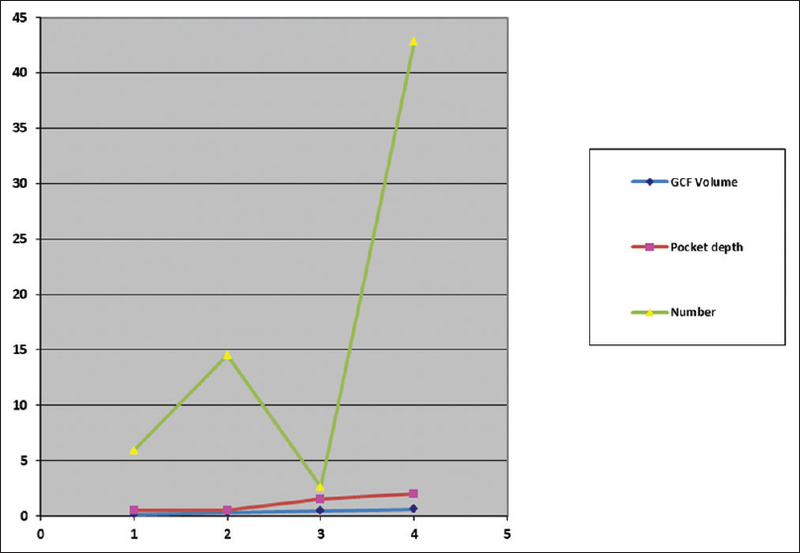 Koregol AC, More SP, Nainegali S, Kalburgi N, Verma S. Analysis of inorganic ions in gingival crevicular fluid as indicators of periodontal disease activity: A clinico-biochemical study. Contemp Clin Dent 2011;2:278-82. Skapski H, Lehner T. A crevicular washing method for investigating immune components of crevicular fluid in man. J Periodontal Res 1976;11:19-24. Griffiths GS, Sterne JA, Wilton JM, Eaton KA, Johnson NW. Associations between volume and flow rate of gingival crevicular fluid and clinical assessments of gingival inflammation in a population of British male adolescents. J Clin Periodontol 1992;19:464-70. Challacombe SJ, Russell MW, Hawkes JE, Bergmeier LA, Lehner T. Passage of immunoglobulins from plasma to the oral cavity in rhesus monkeys. Immunology 1978;35:923-31. Rody WJ Jr., Wijegunasingbe M, Wiltshire WA, Dufault B. Differences in the gingival crevicular fluid comparison between adults and adolescents undergoing orthodontic treatment. Angle Orthod 2014;84;120-6. Lamster IB, Harper DS, Goldstein S, Celenti RS, Oshrain RL. The effect of sequential sampling on crevicular fluid volume and enzyme activity. J Clin Periodontol 1989;16:252-8. Tymkiw KD. The Influence of Smoking on Cytokines in the Gingival Crevicular Fluid in Patients with Periodontal Disease. Thesis University of Iowa; 2008. Available from: http://www.ir.uiowa.edu/etd/26. [Last accessed 2016 May 14]. Greene JC, Vermillion JR. The simplified oral hygiene index. J Am Dent Assoc 1964;68:7-13. Rivas-Tumanyan S, Spiegelman D, Curhan GC, Forman JP, Joshipura KJ. Periodontal disease and incidence of hypertension among older adults in Puerto Rico. J Periodontol 2012;25:770-6. Ellis JS, Seymour RA, Thomason JM, Butler TJ, Idle JR. Periodontal variables affecting nifedipine sequestration in gingival crevicular fluid. J Periodontal Res 1995;30:272-6. Marchetti E, Monaco A, Procaccini L, Mummolo S, Gatto R, Tetè S, et al. Periodontal disease: The influence of metabolic syndrome. Nutr Metab (Lond) 2012;9:88. Umoh AO, Ojehanon PI, Savage KO. Effect of maternal periodontal status on birth weight. Eur J Dent 2013;2:158-62. Gomes SC, Piccinin FB, Oppermann RV, Susin C, Marcantonio RA. The effect of smoking on gingival crevicular fluid volume during the treatment of gingivitis. Acta Odontol Latinoam 2009;22:201-6.